I think the best part of the holiday season is getting together with friends and family. And, although it can be relaxing to just be the guest, I actually prefer being the host. Having a houseful of guests, eating, drinking, laughing and exchanging stories somehow makes the house feel like a home. And I still remember all the parties my parents threw when I was a little girl. I'd help my mother cook and decorate and I'd always be given a chance to join the adults for a little while before being sent off to bed. Good memories. 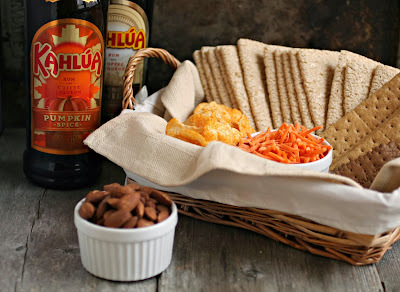 Now that it's my turn to be the hostess, whether it's a dinner party or just cocktails, we always put out baskets of sweet and savory crackers. Plates of assorted cheeses and smoked nuts are always popular and there's usually a crudites plate with a dip. But while my parents always mixed up cocktails to order, Brian and I have learned over the years that's it's easier and more fun to pick a 'house special' cocktail and prep a big batch ahead of time. Of course, we can accommodate anyone who prefers something else but most people enjoy our pitchers of 'special' drinks and each year we learn we have to make more. Summer gatherings tend to involve fruit flavors and the blender but fall holiday entertaining in our house means pumpkin. 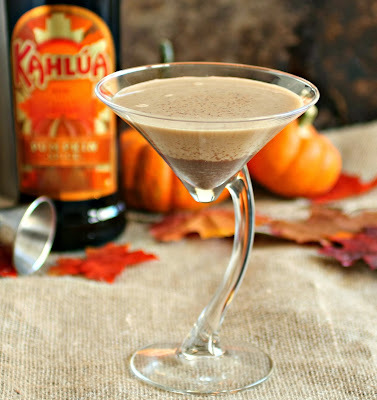 We have several variations but this year we had a chance to try the new Kahlúa Pumpkin Spice flavor and that is now the basis of our house special holiday cocktail. For those of you that missed it a couple of weeks ago, here is the recipe again. 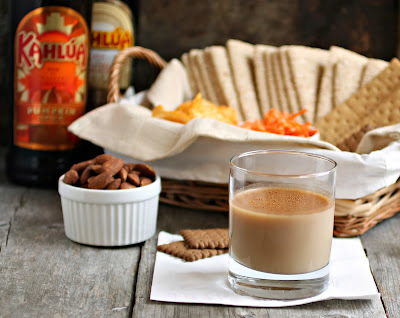 Simple multiply the ingredients by the number of guests you're expecting, pour it all into a pitcher, store it in the refrigerator and shake it over ice to order. But don't be surprised if you have to make a second or even a third batch. Cheers! Can I come to your holiday party? This cocktail looks amazing. Y'all are great hosts! I want to come to you parties because you serve great drinks!! Love that martini glass!!! Great recipe for a party!